Vader finds a mysterious new “ally” to plunge into the darkest depths of the Force. We barely know what the Force is in Star Wars. Pushing, sensing, lifting rocks, projecting yourself across millions of miles—it just scratches the surface of that mysterious ephemeral energy that binds us all together. 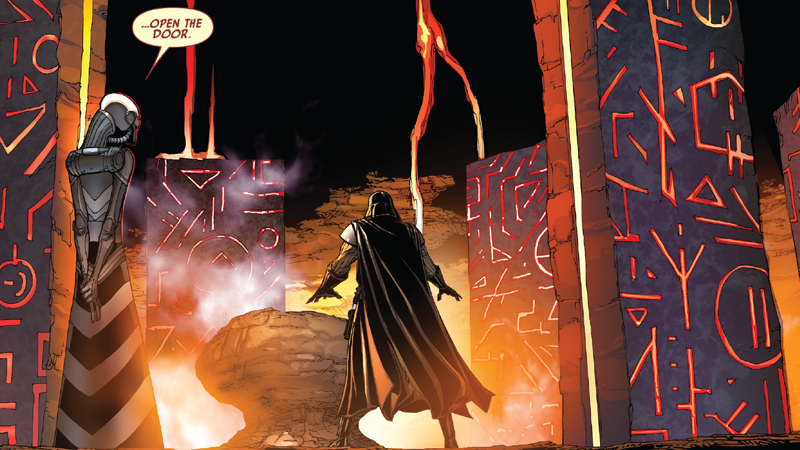 But the latest arc of Darth Vader might have opened a bonkers new door. Hell, it might have blown the door clean off. Darth Vader #23—by Charles Soule, Giuseppe Camuncoli, Daniele Orlandini, David Curiel, Dono Sánchez-Almara, and Joe Caramagna—is the latest in an arc that has sought to explore the origins of Darth Vader’s sinister castle at Mustafar. Star Wars’ incessant need to categorize and overexplain the minutiae of everything we’ve previously seen before can often be annoying, but Darth Vader is less interested in giving Vader’s castle a Wookieepedia entry update than it is with tackling something altogether more interesting: the legacy and history of the Sith that came long before Vader or Palpatine. Vader’s first attempt at opening the door goes awry. Part of the reason Vader elected Mustafar as the site of his not-so-humble abode in the first place (not just for it being the world on which he was “born”) is that it is a planet teeming in dark side energies, and over the course of the last few issues of the series, he’s been exploring and utilizing those energies through another dark side artifact. It’s the mask of an ancient Sith Lord called Momin, an artist who, in a former life, channeled the dark side to create artworks of horrifying death and depravity. Momin’s mask is already a fascinating wrinkle in the realm of the Force considering it’s been presented as being imbued with Momin’s spirit, almost like a physical form of a Force Ghost. Vader’s communicated with the Sith through it, used its advice to design a castle that can tap into the energies inherent to Mustafar, and, perhaps most darkly, fed it—by placing it on a number of Imperial subordinates tasked with aiding the castle’s construction, letting Momin violently possess their bodies. And it’s all been in aid of one thing: Vader believes Mustafar and Momin are the key to resurrecting Padmé. Another failure, another victim for Momin’s mask. The gift of knowing how the rest of Star Wars plays out means we the reader know that Vader is inevitably going to fail in doing his own take on the infamous Tragedy of Darth Plagueis the Wise. But failure doesn’t necessarily mean that the power to influence life and death through the Force doesn’t exist. As Darth Vader #23 frequently reminds us, a door is there to be opened—and Momin and Vader try to do so frequently, leading to an almost comedic montage of redesign after redesign of the castle being built to better channel the growing dark. A Sith? Betraying another Sith? Gasp! The final design—the one we see in Rogue One—seems to be the ticket for the duo, but not in the way Vader had planned. Called away to defend the site from increasingly encroaching Mustafarian clans, who are concerned that the Sith Lords’ channeling of the planet’s energies is destroying the lava world altogether, Vader doesn’t get to see the moment of seeming success for his plan. Using the distraction to his advantage, it’s Momin that opens the door between life and death. Because, of course, what could be more Sith than a moment of betrayal for personal gain? It’s clear there’s going to be more to explain here as this arc—and this run on Vader as a series—comes to an end over the next few issues. Did Momin actually resurrect himself? Is the doorway he opened really between life and death, or is it some kind of translocation—where Momin’s body, separate from his mask, was hidden somewhere in stasis after his apparent death, and Vader’s been duped into reuniting them? Is it maybe even a gateway through time, and Momin’s idea of resurrection is simply bringing forth his body from a time before he died to the present? Is it all just an illusion, and the body we see the mask possess is just a new, albeit familiar looking form for it to feed on? Momin returns from the grave. Or does he? We’ll have to wait and see. We have no idea yet. But we know this: Whatever it ends up being, it could be our first step into a larger, darker understanding of just what the Force is capable of. The Dark Side of the Force is a Pathway to many abilities some consider to be... unnatural.